Hello, my name is Eric Mouffe. 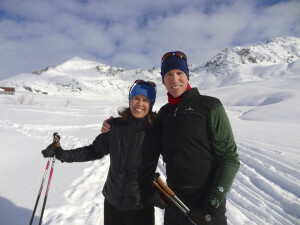 My lovely wife, Christina, and I live in Anchorage Alaska where we enjoy getting out into the wonderful natural environment that surrounds us. Our preferred method of locomotion is using muscle power as apposed to horsepower, and we’re often found mountain biking the single track trails in Kincaid Park, hiking the Chugach Mountains or skate skiing on some of the 140 kilometers of groomed trails in and around Anchorage. We are thrilled to live so close to the outdoor recreation that fuels our passion for natural beauty and a healthy lifestyle. When not pushing my limits physically, I’m pushing cargo far and wide to many corners of this vast state. 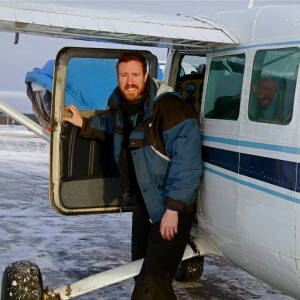 The cargo company I fly for supplies much of bush Alaska with everything needed to survive. From cars to toothbrushes and everything in between, we pack up to 30,000 lbs of stuff into our ancient airplanes built in the 1950s. At nearly 70 years old it’s a wonder these workhorses are still flying, but the venerable Douglas DC-6 is well suited to the environment we take them into. Crooked, 3,500 feet gravel runways at gold mines, or extreme gradient (very steep) runways at Long Range Radar facilities built into the sides of mountains are some of the challenges we encounter regularly. Never a dull moment, it seems. On the relaxed side of life, I design and create functional art in the form of fine furniture, jewelry boxes, marquetry, and stringed instruments. My passion for woodworking started as a pre-teen in my father’s modest workshop. It had a basic assortment of hand and power tools and he did a good job of teaching me the fundamentals of their use. Beyond that, my dad gave me one of the greatest gifts—the gift of self discovery. By turning me loose to build small boxes and wooden toys, he facilitated the growth of my creativity and the joy of using my own hands to turn raw materials into beautiful and useful objects. More and more I love the fine control offered by a sharp chisel or hand-plane, and the quiet simplicity of their use. I still rely on, and treasure greatly, the hand tools passed on to me by my dad. He passed away in the fall of 2015, but the cycle of life has allowed his spirit and legacy to live on. I continue to channel his guidance and honor his memory by means of my creative endeavors. Thank you for checking out my artwork.